Farmers markets really get me excited. Rajat thinks it’s because they remind me of vegetable markets in India. I think it’s because I associate farmers markets with warm weather and fresh, green vegetables that require sunshine and warmth (two things New York has been sadly lacking until the last few days). An even more plausible explanation is that it reminds me of weekend trips to the farmers market and international grocery store with my parents. My search for a good market has gotten a little out of hand. Last weekend I dragged Rajat to two farmers markets on a dreary, gray, about to rain Saturday. We got to each market late and most of the stalls were packing up. Yesterday we walked across the Brooklyn Bridge to Fulton Stall Markets, which turned out to have more artisinal cheese and fresh bread stalls than any produce. 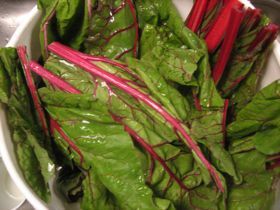 Thank god for the Brooklyn Fairway where I managed to find some bright green leafy spinach and beautiful green and ruby red swiss chard last weekend. Spinach and Swiss Chard Curry with Shitake Mushrooms and Sweet Peas turned out to be a great way to ring in the warm weather that we’re finally getting. I tossed some earthy, hearty shitake mushrooms and sweet peas into a mix of mild pureed spinach with sharper red swiss chard. A tomato based masala added spicy heat balanced out with creaminess from whipped yogurt and milk. I may not have found good farmers market produce but still – hearty food of the earth! Of course, the farmers market hunt continues. Anyone else out there who gets excited by farmers markets? Or should I just save my time and go to the grocery store? Swiss chard makes this spinach dish special because swiss chard has a slightly bitter taste to it. The bitterness subsides with cooking, but you’re still left with a pleasantly sharp taste. When using swiss chard, I prefer the earthiness of shitake mushrooms and mild sweetness of peas, but rich paneer would be a good substitute for the mushrooms as would tofu. I’ve mentioned before that a lot of Indian recipes use a basic masala, which I’ve used to make mattar paneer (paneer and peas), mattar mushroom (mushrooms and peas) and palak channa (spinach and chickpeas). 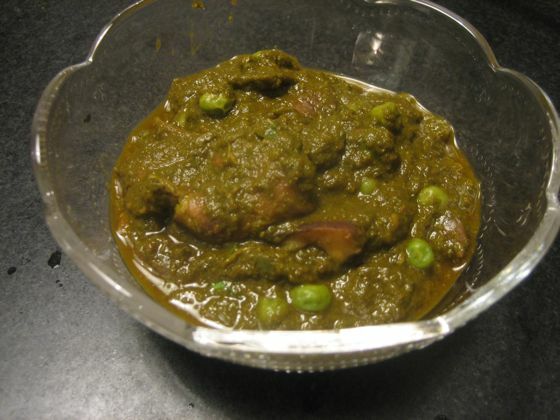 You can find an in-depth post about how to make the basic masala here. I think it’s akin to making a hearty marinara sauce. You have to invest a little bit of time up front to let the masala cook, but the rest of the steps go pretty quickly and the cooking time really pays off by delivering flavor. And once you master this, you’re home free to make many variations of Indian curries. I promise! 1. In a tall stockpot, heat about half to one tablespoon of cooking oil. Add the onions, garlic and ginger and saute until the onions are translucent and the water from them has dried out. Add the tomatoes and green chilies. I dice the onions-garlic-ginger in my food processor then separately puree the tomatoes with the green chilies in the processor. If you don’t have a food processor though, just finely diced everything. Your masala may be a little chunkier but will end up with the same taste. 2. Cook until the water evaporates, stirring occasionally to make sure the masala doesn’t stick to the bottom of the pan. 3. 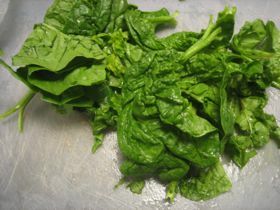 While the masala cooks, prep the spinach and swiss chard by removing the stems and washing. Puree in a blender – you will need to add a tablespoon or so of water to get the blender going. One of the most nerve-wracking moments of pureeing spinach is when you are waiting for the blender to “pick up” the spinach and start the pureeing action. Be patient, it will happen. And if it’s taking awhile, just add a little more water to get it going. 4. After the water evaporates, add all of the spices and cook for another 3-5 minutes. 5. Add in the whisked yogurt and the tomato paste. Continue cooking on medium heat, stirring to make sure the bottom does not burn. Cook for another 5 minutes or so. 6. Stir in the pureed spinach/swiss chard mixture and fold well into the masala. Partially cover and cook on medium heat for about 15 minutes. The curry tends to form steam pockets and bubble up a lot so make sure you partially cover the pot. 7. In a separate saucepan, heat about half a teaspoon of cooking oil and saute the mushrooms for 3-5 minutes on medium low heat. Add to the curry along with the peas and cook for another 10 minutes. 9. Taste and adjust salt and spices as needed. If the swiss chard is too bitter for you, add in about half a teaspoon or so of sugar. Garnish with fresh, chopped cilantro. Must have smelt heavenly! I made dhingri matar today and looking at your greens just makes me wish I had made mushrooms and spinach instead! Very healthy & tasty recipe. Looks yummy and healthy ! Will try this out .. Presumably you’re removing the chard stems because of the pureeing – but just to let folks know, the stems are perfectly edible. Slice them small like celery, and use anywhere you would normally add celery or bok choy. In the above recipe, I would saute them with the mushrooms.